Save the date for 2018’s Live2Lead Conference! This year’s conference will take place on Friday, October 12th, simulcasted live from Atlanta, GA to be viewed by local business leaders in the Des Moines area. 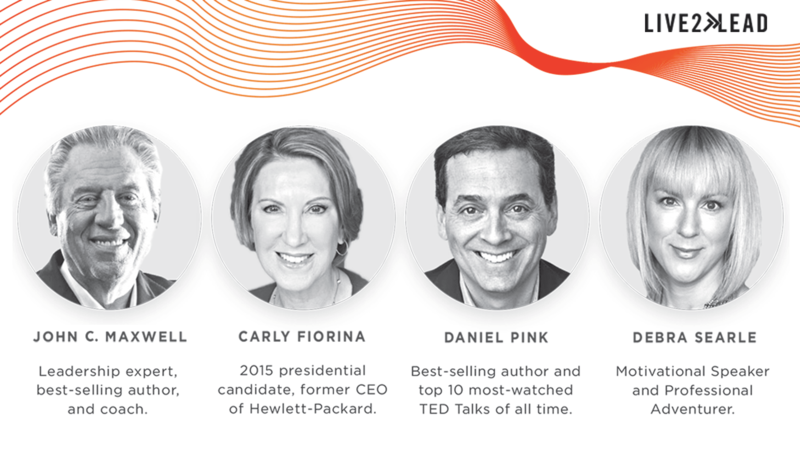 You won’t want to miss this incredible lineup of renowned leadership experts sharing their insights at the event, including John C. Maxwell, Carly Fiorina, Daniel Pink and Debra Searle. Live2Lead is a half-day, leader development experience designed to equip attendees with new perspectives, practical tools, and key takeaways. Learn from world-class leadership experts, and be prepared to implement a new action plan in your organization – with key takeaways that you can start implementing when you get back to the office with renewed passion and commitment. There are two ways to get involved with this Live2Lead 2018 – to become a sponsor (see below) or to buy tickets for you and your team. Last year’s event featured leadership speakers John C. Maxwell, Dave Ramsey, Cheryl Bachelder and Warrick Dunn. Over 250 local leaders were in attendance. Check out the highlights here. John C. Maxwell is a #1 New York Times bestselling author, coach, and speaker who has sold more than 26 million books, was identified as the #1 leader in business by the American Management Association and world’s most influential leadership expert by Business Insider and Inc. magazines in 2014. In that year, John also received the Mother Teresa Prize for Global Peace and Leadership from the Luminary Leadership Network. His organizations – The John Maxwell Company, The John Maxwell Team and EQUIP – have trained more than 6 million leaders in every nation. You may recognize Carly Fiorina as a candidate for the Republican presidential nomination for in 2015. Carly started out as a secretary for a small real-estate business and eventually became the first woman ever to lead a Fortune 50 company. Carly was recruited to lead HP in 1999, during the worst technology recession in 25 years. While there, she re-focused the company on innovation and market leadership again. Under Carly’s leadership, revenues grew, innovation tripled, growth quadrupled, and HP grew to become the 11th largest company in the U.S. After leaving HP, Carly has now focused her efforts on giving back. She served as the Chairman of Good360 (the world’s largest philanthropic organization), and the Chairman of Opportunity International (a Christian-based organization that lifts millions out of poverty around the globe through micro-finance). Named the “Most Powerful Woman in Business” by FORTUNE Magazine, Carly also headed the External Advisory Board for the CIA under President George W. Bush. Best-Selling Author of To Sell Is Human, Drive, and A Whole New Mind. Are you one of the 20.5 million viewers who has watched Daniel Pink’s TED Talk The Puzzle of Motivation (one of the top 10 most-watched TED Talks of all time)? Daniel Pink is one of the best-selling nonfiction authors of the last decade. His books on work, business, and behavior have been translated into 35 languages and have sold more than 2 million copies worldwide. His books include: When: The Scientific Secrets of Perfect Timing, To Sell is Human: The Surprising Truth About Moving Others, Drive: The Surprising Truth About What Motivates Us, A New Mind: Why Right-Brainers Will Rule the Future, The Adventures of Johnny Bunko: The Last Career Guide You’ll Ever Need, and Free Agent Nation: The Future of Working for Yourself. In 2015, London-based Thinkers50 named him, alongside Michael Porter and Clayton Christensen, as one of the Top 10 business thinkers in the world. He currently serves on the advisory boards of Hubspot, Heleo, Betterment Institutional, and RiseSmart. Debra is one of the most prolific female speakers on the European circuit and has spoken worldwide to over 1,000 companies, including clients such as IBM and Microsoft, as well as speaking at events such as TEDx. As a professional adventurer and serial entrepreneur, her expeditions have included rowing solo and unsupported across the Atlantic and sailing around Antarctica. She has launched four companies, is a published author, and has worked as the host for BBC. Debra’s spirit of adventure gained her an MBE from Her Majesty the Queen and a place on the board of The Duke of Edinburgh’s Award. She co-founded the Business Women’s Network Forum which meets at Buckingham Palace. Early bird tickets are now on sale! Buy early and save big on tickets for your whole leadership team! General Admission and VIP tickets for your executive team. An ad in the conference workbook. A table display during the event. If you or your organization are interested in becoming a sponsor of 2018’s Live2Lead event, please contact me by July 10th.